Daughter of Nexus is an adventure offering for White Wolf’s fantasy RPG, Exalted. This adventure is published in PDF form and is another prong in White Wolf’s fairly aggressive and welcome acceptance of the PDF medium as a way to do business. This is particularly desirable for Adventures, I think, as the production costs and the sale price can be kept low though, at nearly seven dollars – for which you can get PDFs two and a half times as big and with more content – I still don’t think they’re getting the price point right for their electronic offerings, after all, adventures are pretty much disposable products, with little in the way of replay value and few elements that can be effectively reused. 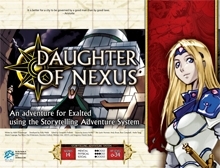 Daughter of Nexus is a pretty straightforward adventure and, like almost all written adventures, it suffers the usual flaws. Namely it is extremely railroady, taking the players from point to point to point with little wiggle room and no real contingency plan for when players go off the rails. The handy flow charts that are included give some very limited amounts of choice and do make it easier to keep track of things but there’s no denying this is an adventure and just an adventure. The story follows a young girl named Arvia, future city-goddess of Nexus, kidnap victim and political and metaphysical tool. The circle are hired to retrieve and protect her and, in the process, end up entangled in the machinations of the city government, the Deathlords and the Fey, though considerably more time is devoted to hitting things with an assortment of objects than dealing with the social and political complications. The artwork is of a good standard throughout though the cover is a little lacklustre without that element of design flare that White Wolf used to be noted for, it also uses what seems, to me, to be one of the weakest pieces of art in the book for the cover. A depiction of Arvia, (or perhaps Sailor Moon) that is less good than some of the interior art. Layout is functional and effective, but again lacks that polish that White Wolf lead you to expect from them. The writing is clear and relatively concise, perhaps too concise in some places where some extra exposition and description could compensate for the linear nature of the adventure. As a tool for running an adventure the booklet is written very well, filled with useful things like alternative rules and flow diagrams of the plot which makes it easier to run. Still, despite claiming to be about certain topics, and it arguably is about those still in some sense, it is mostly an excuse for a string of fights and these battles seem to be the main thrust of tactics of nearly all the antagonists involved. Daughter of Nexus makes good use of the rules, presents character sheets for all the key players and includes alternatives in terms of powers and statistics if one does not have all the necessary books, which is a lovely courtesy and thought to extend to Games Masters who may not have everything. The villains of the piece, if they survive, may be reusable later on as repeat antagonists for the players but it isn’t likely that many of them will survive encountering the circle. Villains have some re-use value. Formatted to be read from the screen. Not so suitable to be printed out for use. Look for Exalted eBooks at the Flames Rising RPGNow Shop.